Each year on November 11, we take time to pause and recognize the sacrifice and service of all military personnel that served in the United States in all wars, particularly living veterans. With this year’s Veterans Day falling on a Saturday, the holiday will be observed on both November 10 and November 11. Originally started as a holiday to reflect upon the heroism of those who died in our country’s service, Veterans Day was initially called Armistice Day. November 11 became the designated day of observance due to that date being the anniversary of the singing of the Armistice that ended World War I. In 1954, the name of the holiday was changed from Armistice Day to “Veterans Day” in order to pay our respects to all of those who served. Today, the ExpressTaxFilings team pauses to celebrate and honor America’s veterans for their unwavering patriotism, willingness to serve, and sacrifice for the common good of our beloved country. 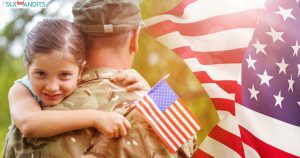 ExpressTaxFilings and the Internal Revenue Service (IRS) are committed to providing assistance to all Veterans. For more information on tax credits and benefits, tax preparation, financial education and asset-building opportunities available to Veterans, click here. May we never forget the many sacrifices made by those who served our country faithfully. Created in 2013, ExpressTaxFilings strives to make e-filing accessible to businesses. We believe that while taxes can be complicated, solid research paired with great customer service, along with accurate and efficient software, can make your tax filing much easier. Our cloud-based software is supported here in the US, and we carefully study tax guidelines to stay ahead of changes. With US-based customer support, we know that we will answer your call faster than the IRS will. If you need any assistance during any step of the e-filing process feel free to reach out to our dedicated, US-based ExpressTaxFilings support team. We’re available Monday – Friday from 9 AM to 6 PM EST at 704.684.4751, with extended hours during deadline days. We also offer live chat and 24/7 email support at support@ExpressTaxFilings.com. We constantly strive to lead our clients as a compassionate resource, guiding you through complicated tax matters and making the e-filing experience as accurate and efficient as possible. We’re here to support businesses because when you succeed, we succeed! Is Your Nonprofit Prepared the Way it Should Be?